I am a hypocrite. I eat meat and yet I am queasy to discuss it's source. I am fine picking up a tray of frozen chicken legs, which look so pale and white and detached sitting besides the tray of chicken nuggets that you would doubt they ever belonged to any creature roaming the face of earth. And all this when I spent a good chunk of my years in a country where we never went to air-conditioned super markets and where carcasses with all gory details hung at the street side butchers. I wouldn't look at them. I would shield my eyes and look the other way when I passed them on familiar routes. I knew the Sunday Pathar Mangsho'r jhol did not just magically happen and Baba sourced the mutton from these very places. And yet I never ever decided to give up meat. Did I tell you, I am a hypocrite ? The tray of frozen chicken legs however do not taste good. The small Cornish hen is the best but then I have to cajole the husband into cutting and cleaning. Now the chicken from the small Halal Meat Shop, owned by the bald headed Middle Eastern Guy who also sells Majdool dates, is much better. So there the husband is sent every Saturday to get meat to be cooked into rich curries with pale green cardamom and slender sticks of cinnamon. I sit in the car outside hoping that pieces are done right, the skin is off and the bird forgives me. And then one fine day I decide to take over. I enter the small store, the bell tinkles marking my entry or is it announcing the turn in my life. The store smells heavily of incense and some ballad seeping in dessert love plays somewhere. The butcher is an amiable middle aged man with a heavy accent. I am not sure about his English and give out instructions in Hindi. I call him "Bhaiya" and tell him exactly how I want my pieces. And then I run away to the front of the store. I don't look at his work. Back home the husband says the store is owned by Egyptians and none of them understand Hindi. Couple of months later and I am bolder. He, the butcher, now calls me "Sister". I still talk to him in Hindi mixed with English. He talks to me in his own language mixed with English. We exchange pleasantries. All is well. I still hesitate to tell him how I want, what I want, but he understands. He makes me minced meat out of chicken breasts. I know he is not putting in anything but that in his grinder. I feel better and on the way out I also get some dates. BS loves meatballs. They make her happy and sweet. I used to get a pack of frozen turkey meatballs for her from the PriceClub. She liked them, I was ok. 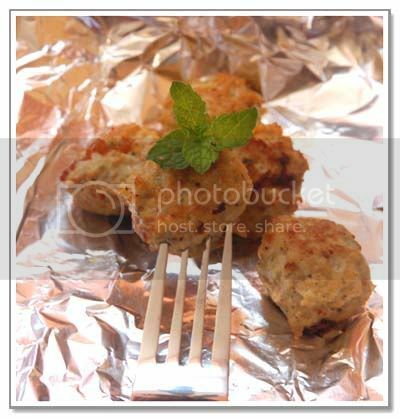 But then I realized that we could freeze meatballs in a mail from Happy Cook when she tried my Kofta Curry. I wasn't sure if they would be soft on baking though. Like these Chicken Masala balls of mine are softer on frying than baking. 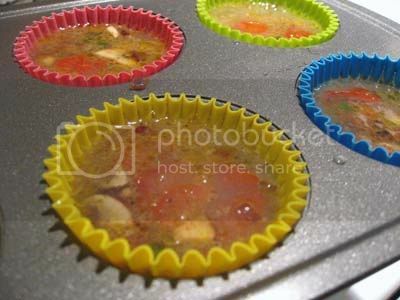 And then I saw this recipe and the blogger saying that these freeze very well and she also baked it. So I added breadcrumbs and eggs to the ground chicken along with all spices I usually do. I added some mint and corriander leaves for that Indian herb feel. I did not add onion. 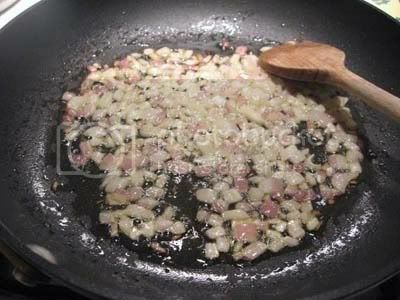 If using onion I would suggest you fry them and then make a paste or add to ground chicken. Also you can go totally creative and add your own spice combo to the minced meat. I made some fresh meatballs and immediately baked them. They tasted great. I think the eggs made them really soft and juicy on the inside. Then I froze them raw in a single layer in the freezer. After they were all individually frozen, I put each days portions into separate freezer bags. I have used them up within 7-10 days so far. 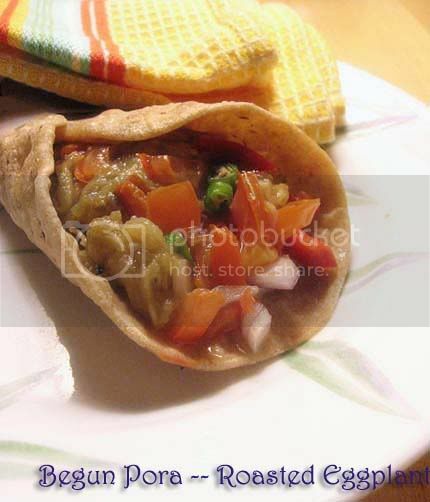 They work great in Pasta, in a sandwich, wrapped in a Roti or just by themselves. Update: I fried some and added them in a curry yesterday and it was a quick delicious meal. How do you make your meatball ? 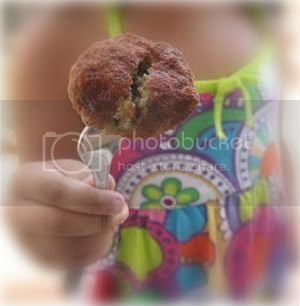 How about a veggie ball ? If you haven't done either, time is up, do it now. It is easy and saves you a lot of time on a busy work day. Update: To make things clear, I froze the raw meatballs. But Kay says in her comment that she bakes and freezes them, whick makes it even better. She does not add egg and adds molasses and they stay good for 3 weeks. I got my ground chicken freshly made from my local butcher. I had about 1lb & little more of ground chicken. Fry them or bake them to serve. While frying very little oil is needed if you have shaped them like burger shaped patties. Little Sis aka LS is not a gourmand. She might be a connoisseur of food. I am not exactly sure. Any time I sit down to feed her, she asks with utter contempt in her voice "Eta ki ?" (What is this ?). That question makes me extremely nervous. I have a feeling that she expects me to say "Lobster Thermidor" or some such thing. I cannot get myself to say it is just plain old "Khichuri" so I try to distract and in most times end up popping a Purple Dinosaur in the age old VCR. LS loves "Chickun" though and a "Chickun Jhol" makes her eat at least a quarter of the meal with no request for complicated recipes and fine French food. A month or so back, me being the Bong Mom and all that introduced Fish to her. I mean Fish as food and not "Oh Fishy Fishy". Only I felt very guilty telling her that it was Fish because kids seem to have this love for rainbow colored "fishies" and I thought I will tell her the truth when she is able to beat up buster next door. So we still tell her it is "Chickun" but I know she has her doubts because she keeps asking "Eta ki" repeatedly and taking pieces out of her mouth and scrutinizing them with a microscope. Last week I made this fish curry for her. Big Sis aka BS totally loved it and the love continues this week. About LS I am never sure. This Dudh Maach or Fish Cooked in Milk is a great fish curry that works with most kinds of fish and every age. I mean age of the person eating it. This is my Ma's recipe and we love it so much that it gets made very often at our home. That it is quick is a huge help. The light gravy has a subtle mustardy taste but amazingly there is no mustard in the recipe whatsoever. You know how some people will strain their mustard paste and use only the mustard water to make their gravy, well this gravy tastes almost like that, only with zero amount of prep work. And if you are feeling queasy and creamy about milk and fish, be calm, this is no where near creamy. I use 1% Milk and the gravy is very very light. We have done this with Rohu (Rui Maach), Ilish (Hilsa) and Tilapia Fillet. The taste is great with all. If using the Tilapia fillet you can either shallow fry or bake in the oven. Enjoy this with fluffy white rice and you will never regret it. Note: Instead of Mustard oil I use Olive Oil or Canola for the kids who are yet to get used to Mustard and the taste is compromised only a little. So if you don't have Mustard Oil use your regular cooking oil. If you can get hold of Mustard Oil, well the taste then takes on a new dimension. 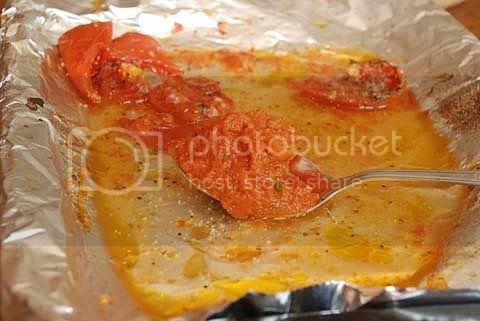 If you are using steak pieces of fish clean the fish pieces and smear with turmeric and salt. Keep aside for 15-20 minutes. If you are using Tilapia Filet rub the fillet with little turmeric, salt and few drops of Oil. Heat Oil(Mustard Oil preferred) in a Kadhai or Frying Pan. Fry the pieces of fish till golden on both sides. Heat 3 tsp of fresh Mustard Oil in a Pan. Temper the Oil with 1/4 tsp of Kalonji/Nigella seeds and 4-5 green chili (slit the chili if you like the heat).There will be a lot of spluttering so it is wise to cover the pan with a splatter screen. Meanwhile in 1 cup of Milk add 1/4-1/2 tsp of Turmeric powder and mix till you get a nice daffodil yellow. Add the milk to the pan and let it simmer till it comes to a boil. Be careful it might just froth and spill. Now add 1 more cup of water and salt to taste, let the jhol simmer at medium heat. Once you see it bubbling add the fish pieces and simmer for 2-3 more minutes. Switch off heat and garnish with freshly chopped coriander leaves.Let the gravy soak up its flavor. Drizzle a few drops of mustard oil to jazz up if you wish.Serve with white or brown rice. Begun Pora -- the rustic suburban cousin of Upper East side Ms. Bharta is a very simple, easy and quick if you can rope in the husband, dish. The only scary part in this whole thing is roasting the eggplant, on the open flame, till it is charred and your smoke alarm starts ringing and the sprinklers go on and there are good looking firefighters ringing your door bell. 1.On a balmy Tuesday afternoon when the birds are chirping and the wind is gentle hand the hubby a beer and an eggplant. Ask him to put it on the outside grill and keep a watch. Tell him he might get Begun Pora if he is good and some wilting lettuce if he is not. However un-romantic this might sound, the Bong hubby will watch and give you an eggplant that is done just right. 2.On other afternoons when nature is not on your side, rub the eggplant with that golden yellow pungent Mustard oil of yours, sprinkle some salt and stick it into the broiler.In 45minutes to an hour the eggplant will be charred to perfection. Puritans will insist that you are missing out on the smoky flavor this way, which is true but anything better than cleaning a messy stove or meeting a firefighter in cooking dungarees, I say. So after that eggplant has been done by the husband or the broiler or the ripping flame as your case might be, let it cool. Remove the charred skin and scoop out the soft velvety insides. To this add some more of that Mustard Oil(yes, you must), fresh chopped green chili, finely chopped onions and fresh corriander leaves and then mix with your fingers. It is a sensational feeling. 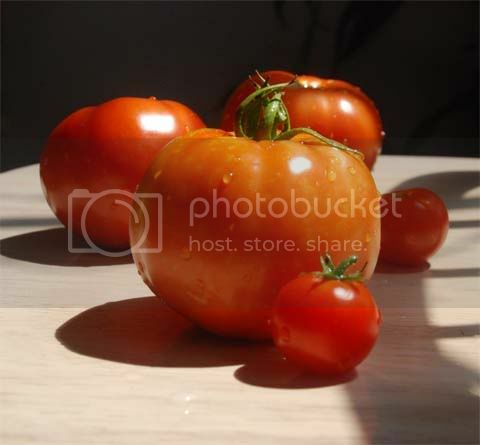 Now me being me and wanting a novelty in even my begun pora, I roast some tomatoes and garlic and add it to the above mix. 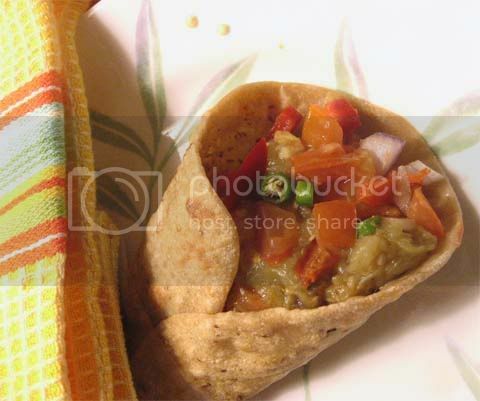 Wrap it up in a roti and have your dinner. My roti making skills are terrible and the six year old claims she can roll a better one than me, so if such is the case wrap it up in a tortilla. Now that was quick wasn't it ? Less than 30 minutes of your live time for a Bong dinner. 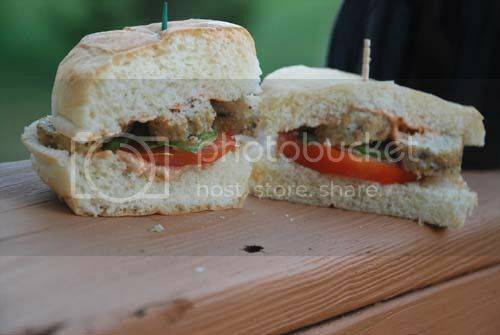 You can also do the eggplant in the broiler a day before and just do the quick mash and mix when you are ready to eat. Score the tip with a knife. Rub with salt and a tsp of mustard oil. Now broil in oven or grill it on the outside grill. To broil in oven -- put in a baking tray lined with aluminum foil, drizzle some more oil on top and broil. It usually takes between 40-50 minutes to an hour. Once the eggplant has cooled remove the charred skin and mash the soft, velvety flesh. 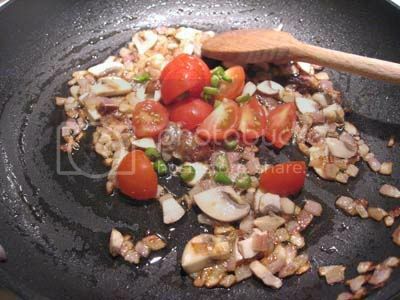 Add Mustard Oil and mix finely chopped onion, finely chopped green chili, salt to taste and finely chopped tomatoes. If you wish you can roast some tomato and garlic in the oven and add it to above. Garnish with fresh coriander leaves. Let it sit for a 10-15 minutes to soak up the flavor. Now scoop it up with a roti and eat. It is still summer vacation time around here. 2 and half weeks more to go, almost 3 for many. The first half of the vacation BS spent in idyllic bliss with the grandparents being here. The second half Mommy is in charge and things are not so idyllic any more. For one Mommy is hyper and lazy at the same time. Instead of judiciously spending her time making alu parathas for the kids or giving them a much needed oil massage, all she wants to do is projects. Mommy's modern parenting bible says "doing projects with kids" ranks high up right after "say good job to your kids every 5 minutes" . Mommy sure hated supervised projects in her own childhood but now wants BS to give up the idyllic nothingness for such ruthless acts. Thankfully for BS, her little Sis ensures that no project that involves gluing, cutting or even detailed coloring gets done while she is around. The remaining short ones that gets done BS loves them. One of the things we have been doing recently is inspired by Jaya and her little girl. From her post I got the Origami link and it is the perfect thing to do even when LS is around. We have done a Tulip with stems, a fortune teller(remember "Color, Color, what color") and a Pelican so far, It is easy, fast and fun. We use paper around the house, BS colors them and voila there is some new thing after all the folding. Next is something we started for my pure own selfish desire. I wanted some Ganesha motifs on my walls and I thought why not make BS do them. So I got these 8x10 canvas, some acrylic paint and self-stick rhinestones. 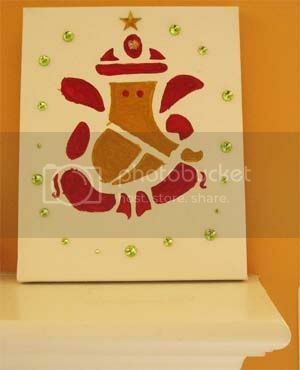 I sketched geometric Ganesha pattern on the canvas and BS colored them in and stuck rhinestones. We have done only one so far. But we plan to do two more in diff colors. I will show you all three if and when they get done, keep your fingers crossed. Note to new Moms: Doing projects and saying Good Job in moderation is ok. Don't go overboard with them. Now to the food which keeping in tune with my status this month is quick, easy and simple needing no more than 30 minutes of human involvement. 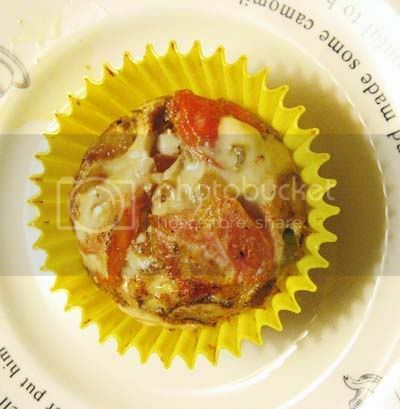 Since the day I started making Kalyn's Egg Muffins they have jostled everyone out to be my first love on "no-time-what-do-we-have-for-dinner" days. Practically that would mean every day but if you have something every day they lose their charm and do not deserve the attention of a first love so I save them up for "really-really-no-time" days. 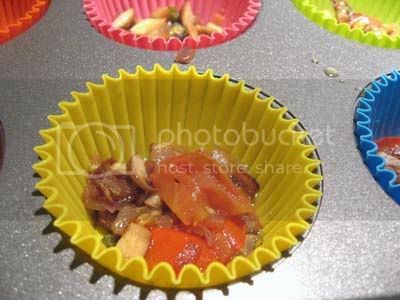 This time out of a sudden whim I fried onions, tomatoes, mushrooms, green chilis and made them the base for these muffins. They tasted so good that I thought to have them here lest I forget and never ever do the same again. Note to myself: "Please, please make them again this week. They were delicious". Add chopped mushroom(baby portabella in my case) and saute. Season with salt etc. 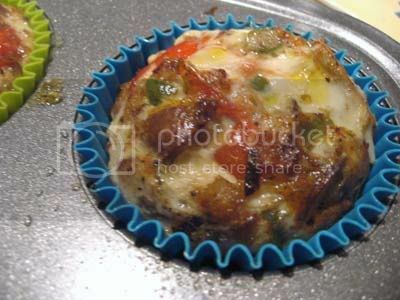 Scoop out the onion-mushroom mix and put it in each of your muffin pan. You can top with grated cheese if you wish. Bake till they rise. Eat them up quick. Have I told you I am so messed up right now that the one day I mange to reach the gym I arrive there in my flip-flops ? Have I told you that no one thinks I am a super mom, not my mom, not the husband's mom, not the kid's mom, not the husband's mom...ok I repeat. If I have how did you ever expect that you will see step-by-step pics of food getting cooked here. Don't you think your expectations are lofty, your aspirations are sky high and you might actually do good if you write the GMAT than browse through my page ? So the bottom line is there is no Step-by Step pic, there are few steps, all others are missing. And really this is a very simple recipe, not even a recipe actually, tomatoes thrown together to be blended and roasted before they are thrown together and sun-dried tomatoes and basil added before they are blended and red ripe juicy tomatoes picked from my very own tiny veggie patch before they are roasted. You get the drift ? Now go ahead and make it. This is a beautiful sauce that you can toss your pasta in. My girls adore it and that is something. I make the pasta like this, you do your own way. And please do remember I use my small toaster oven for such things in small quantity, so my temp settings might be different, be careful about your own oven settings. Chop & Roast two plump juicy red tomatoes and 5 cloves of garlic drizzled liberally with olive oil and generously dusted with garlic pepper powder and salt till the tomatoes are well roasted. Be careful, do not burn them. In my toaster oven, I had the temp at 400F and it took me about 30-35 minutes. Add some fresh basil. 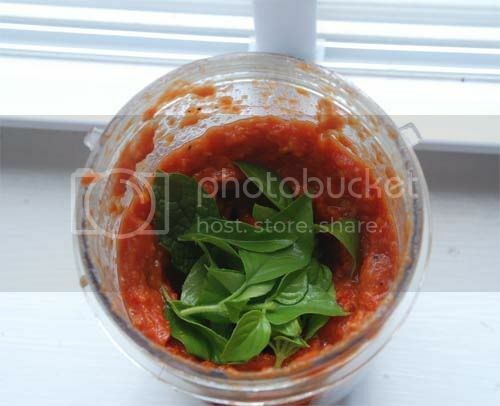 Blend with above to make a fragrant Tomato Basil Paste. 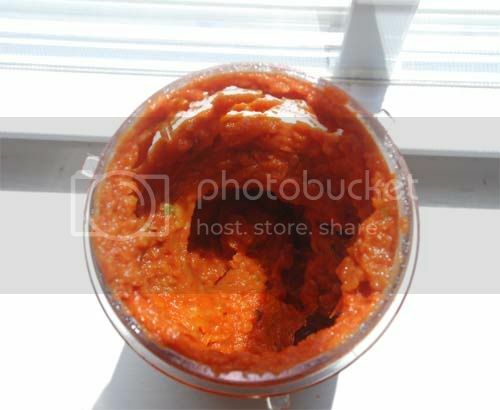 If the tomatoes are not sweet, and you think the paste is a bit tart for your paste, add a little sugar when you are using it. Cool and store in the refrigerator. Till date I have kept such pate for 7-10 days. While tossing Pasta make the sauce more liquid by adding pasta water like here or add some olive oil. I had never thought I would make a Mutton Rezala at home. Heck, I didn't even know how to make a Rezala. 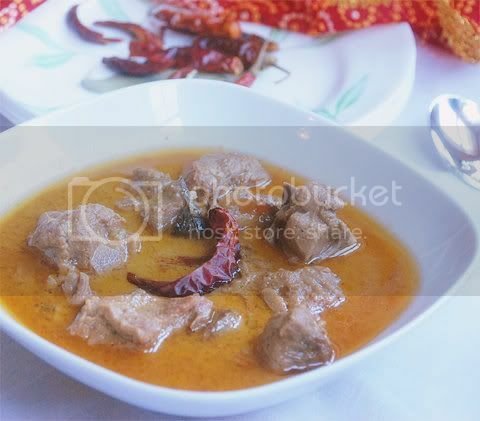 All I knew was that Mutton Rezala was a very fragrant stew kind of mutton dish that could be found at Sabir's in Kolkata. It was heavenly but with years the taste had ebbed its sharpness and I couldn't recall how exactly it tasted. All I could remember is the anticipation and the fragrance when Baba would get Biryani or Paratha-Rezala from Sabir's on some days back home. But then I had the same excitement when he got chicken roll from Nizam's or pastries from Flury's or Khasta Kachuri from neighborhood Mahaprabhu. So you see the tastes weren't distinct in my memory anymore and I had learned to live with the fact that Rezala was that one more unattainable thing from the past. It was a dish fit for the Nawab's who led a very luxurious and sedate life style and had no place in the new age Western World. 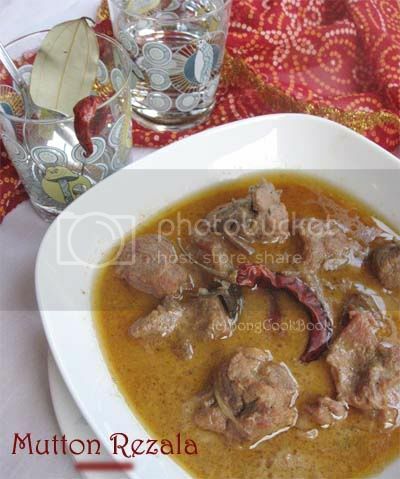 I still thought Mutton Rezala was not something you made at Home. Hey, even Sabir's chef thought it was impossible and he would know. And then I saw Kalyan making a Chicken rezala at home. That was the thing that set me on track about this whole Rezala thing. And then I see Mr.Ghosh our UshnishDa making not only Mutton but Paneer and Aloo Rezala at his very own home. Hmmm...so I guess Rezala can be made at home after all. If all these male of the species have done it successfully, the female power could do it better I thought. Did I say better ? Ok, kidding, I did not mean better. Why would I say better ? I mean how can it be better than Anis Ahmed's slow cooked rezala on "charcoal fire". We are the liberated, powerful, modern female. We do not use charcoal fuel. We know better. Ok what is this with better, dang, not better, best. We know best and Rezala might not be one of them. Who cares ? But my gas cooked, pressure cookered, first attempt Mutton Rezala was really gorgeous. It was fragrant, the mutton tender and soaked with all those spices, the gravy light but spicy and everything that I could possibly ask for in a Rezala. The flavor of this dish comes from the whole spices, the cardamom, the javetri and then the magical drops of Kewra water. Everyone who had it loved it. I am not sure if they recognized it as a Rezala but they loved it none the less. Since I was making this for a small lunch gathering, I made it richer and spicier. For an everyday Home Version you can choose to go light. I have mostly followed this recipe but have also taken pointers from this and this. 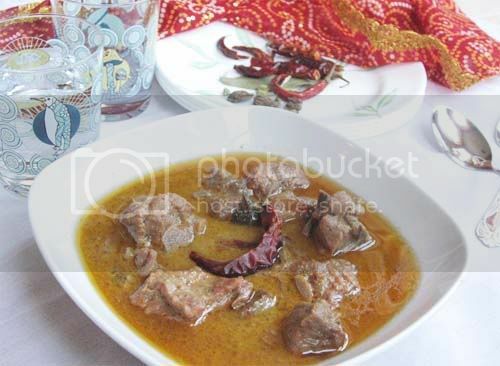 I have made Mutton Rezala but you can easily substitute Mutton with Chicken or even make a Vegetarian Rezala. Grind to a dry powder the spices listed under "Grind to Dry Powder"
In a big large mouthed bowl (or use an aluminum tray) add the washed and cleaned mutton pieces. Let it rest for 2-3 hours, overnight is better. Temper the Oil with all spices listed under Whole Spice. Add about 1/2 tsp of sugar. Remove the meat pieces from the marinade, shaking off any excess liquid and add to the pan. Saute the meat pieces till the raw pink coloring is gone. A lot of water will be released at this point and it will smell heavenly. In a bowl beat about 2-3 cups of yogurt + cashew paste. I also add a little sugar to the yogurt. Lower the heat and add this along with the remaining marinade to the pan. Mix everything nicely. Note: Use 3 cups for a lighter gravy, 2 cups for not too soupy one. Transfer everything to a Pressure Cooker.If you think that the liquid is not enough, add some water.Add a tsp of Kewra Water. The Kewra Water is important, DO NOT skip it, you can use Rose Water if you don't have Kewra Water. Now close the lid and cook till Mutton is tender. Do not over cook. Since I had marinated the meat for close to 18 hrs, mine was done in 10 minutes after full pressure build up. Note: If you do not have a pressure cooker, you can cook the meat in the pan but it will take about 45-60 minutes. 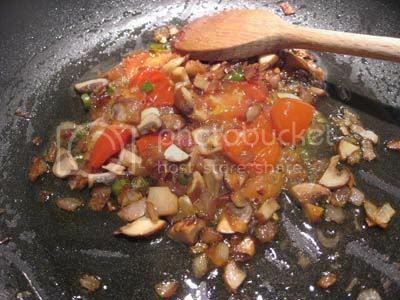 You will also need to stir in between and add water if necessary to avoid the meat from sticking to the bottom. In a small bowl heat 1-2 tbsp of milk. Add a few strands of saffron to the warm milk and mix. Once the meat is done and you can open the lid of the cooker add the milk+saffron and close the lid again. Let it sit for 30 minutes and then serve with Rice, Biryani or Naan. Trivia: The Mughal influence in Bengali Cuisine was reinforced in the Raj era, when Kolkata became the place of refuge for many prominent exiled Nawabs, especially the family of Tipu Sultan from Mysore and Wajid Ali Shah, the ousted Nawab of Awadh. The exiles brought with them hundreds of cooks and masalchis (spice mixers). These highly accomplished cooks came with the knowledge of a very wide range of spices (most notably jafran saffron and mace), the extensive use of ghee as a method of cooking, and special ways of marinating meats.